Get Your FearlessFlighttm Kit today! Download the Kit today and free yourself from the ...surly bonds of Earth! 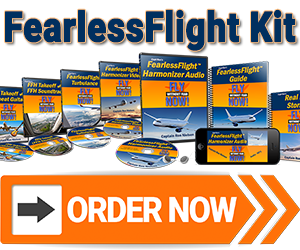 The FearlessFlighttm Kit comes with the above files, a guide on how to get the most out of your FFK and instructions for downloading and installing the components on your desktop/laptop and/or your mobile devices. Please click the check box to the left of product image to select the product. I listened to the FearlessFlight Harmonizer over and over and felt great!! My husband was so impressed at how well I did! He said that by far, this has been the best I have ever done! Turbulence did NOT (and it always does) bother me at all! My greatest fear of flying was that I will have a panic attack. Before meeting Capt Ron and purchasing the Fearlessflight Kit, I had worked with many therapists. While all helped to some extend, none was even close to be as effective as the FearlessFlight Harmonizer. Now, when I know I have to fly, I listen to the Harmonizer every day leading up to the day of my travel. The Hamonizer works by actually triggering the panicky feelings that used to occur day of flight and while waiting and then making them disappear one by one. It works so well for me because it is very different than the relaxing environment of home practice or therapist office. When I am done listening to the FearlessFlight Kit I felt like I had been thru a flight by the time it is over. I also love the focus on excitement of travel and having the courage to engage in the life that the Harmonizer focuses on. Capt Ron, thank you from the bottom of my heart. To begin, I have had a history of panic disorder and planes have been one of the triggers for my panic reaction. I want to tell you that after listening to your FearlessFlight Harmonizer with bilateral stimulation I am a lot calmer than normal before I travel. I have 5 flights coming up this summer and am looking forward to them. Imagine that! Thank you so much! Where to begin!? I guess by saying thank you to you Capt. Ron and the FearlessFlight Kit! Our trip to New Zealand was great. We were on 7 flights and even on a helicopter flight which landed on top of a glacier!! Wow, was that an experience!!!! We flew very close to the mountain tops and at 10,000 feet there was some turbulence. I sat in the front seat next to the pilot. As you and the FearlessFlight Kit instructed me, I focused on the beauty of the snow and high mountains. I felt some fear but handled it well and am so proud of myself. Thank you for your help and for creating the FearlessFlight Kit. I'd been flying since age 2, virtually all my life without incident or a single negative thought until I was in my late 20s. Around that time, though, negative thoughts began to creep into my head each time I flew, feeding upon themselves in a feedback loop to the point where I became profoundly scared of flying. This happened despite all my efforts to rationally explain to myself how safe flying is. I continued to fly, but I dreaded it. I knew I needed help! I found Captain Ron and FearlessFlight.com via a Google search. Taking one of the Fearless Flight webinars set me off on the right path. Then I downloaded the Fearless Flight Kit. Together, they have demystified flying to the point where I have a much better understanding of the sounds and sensations that used to set me off into a panic. They have helped me minimize my negative thoughts. I wouldn't say that I fly completely without fear, but very nearly so, all thanks to you Capt Ron and your FearlessFlight Kit. I had to go on our corporate jet to Dallas yesterday and come back today. I did well on the trip there! When the turbulence hit I remembered one of the FearlessFlight Kit solutions and actually tried to enjoy the turbulence! I enjoyed Capt Ron's class…I felt confident and relaxed after listening to the FearlessFlight Kit! Thank you! © 2017 FearlessFlight LLC. All Rights Reserved.